A warm front has been moving north across the metro today, putting the region back into warmer, more muggy air that has remained south of us today. The warm front is lifting north as low pressure moves east across the Missouri Valley from Kansas towards the southern Great Lakes region by tomorrow evening. Meanwhile, a potent front sweeps towards the region on Tuesday. Surface map from the National Weather Service valid overnight tonight shows the warm front just to our north with strong low pressure over Kansas. 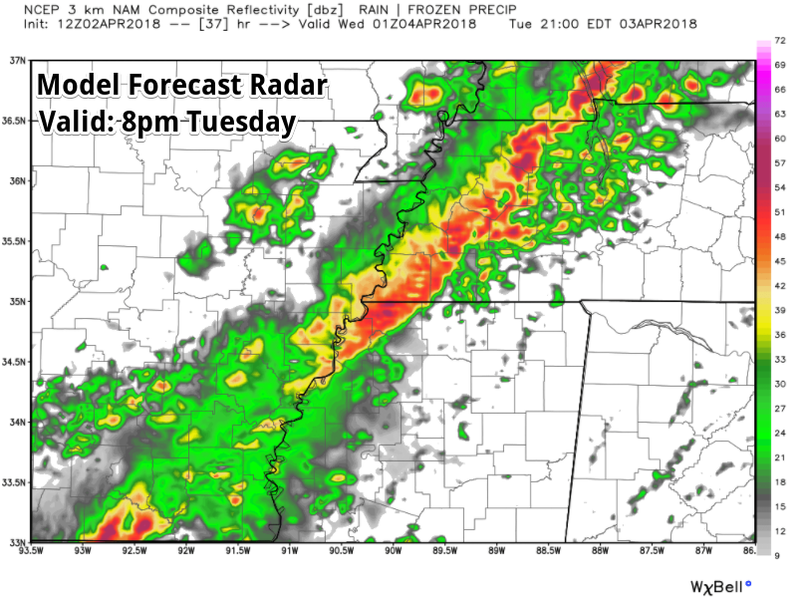 On Tuesday, the Mid-South will be firmly entrenched in the warm sector of the approaching system, resulting in a windy day with southerly gusts of 30-40 mph and eventually partly sunny skies. (A Wind Advisory is in effect for counties east of the Mississippi River on Tuesday.) The appearance of the sun will boost instability indices, meaning the air will be more unstable, similar to turning the heat up on a tea kettle (or a pot of water on the stove, for those that don't drink hot tea!). As the front approaches by late afternoon, thunderstorms will develop to our west and gain strength as they move into an airmass marked by temperatures in the mid 70s and dewpoints in the lower to mid 60s. A watch box appears likely. As the storms band together into a squall line, they will race across the Memphis area during the early evening, also likely prompting severe weather warnings. Behind the front, wind will shift to the northwest and remain gusty, quickly ushering in much cooler air. Temperatures will fall to near 60 degrees immediately when the line hits and then through the 50s during the late evening and 40s overnight as skies clear. Wednesday morning lows will be in the lower 40s with wind chills in the 30s! Despite sunshine, highs only top out in the 50s Wednesday with a reduced north wind. Thursday morning lows will be in the 30s and could result in widespread frost, particularly outside the city. Tuesday early evening brings a decent potential for severe storms. Know where you will be during the times of concern and what your action plan will be if warnings are issued. Keep in touch with your favorite local weather sources throughout the day for any updates. And finally, have multiple ways to receive these warnings. 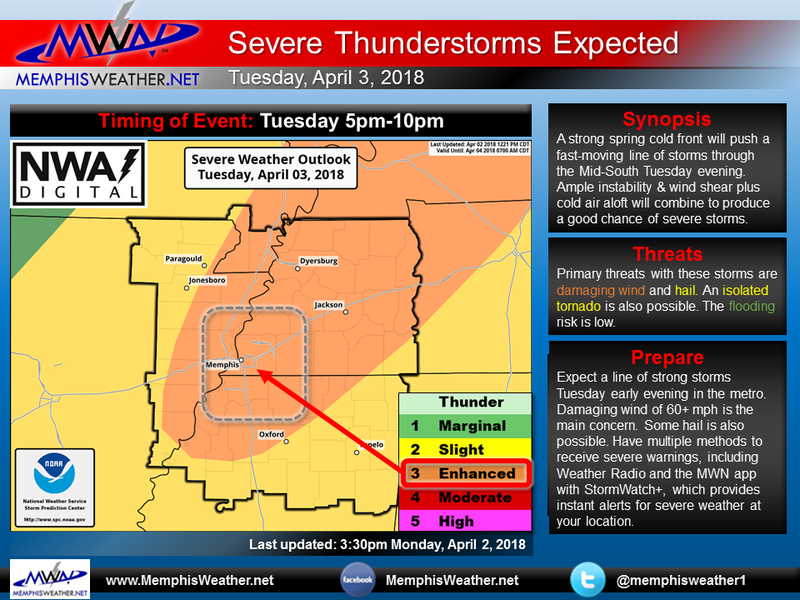 We strongly recommend StormWatch+ Alerts in the MemphisWeather.net mobile app, available through a one-time in-app purchase, to provide you pinpoint warnings for your specific location. In addition, gusty wind throughout the day will require that you secure any loose outdoor objects in order to avoid losing them! Finally, don't be surprised by temperatures that are about 35 degrees colder Wednesday morning than they are on Tuesday afternoon!